Spain is a fun place to live and a big part of that comes from it’s amazing fiestas and festivals throughout the year. Most of these events come from religious holidays but dont be fooled, that doesnt stop the party! 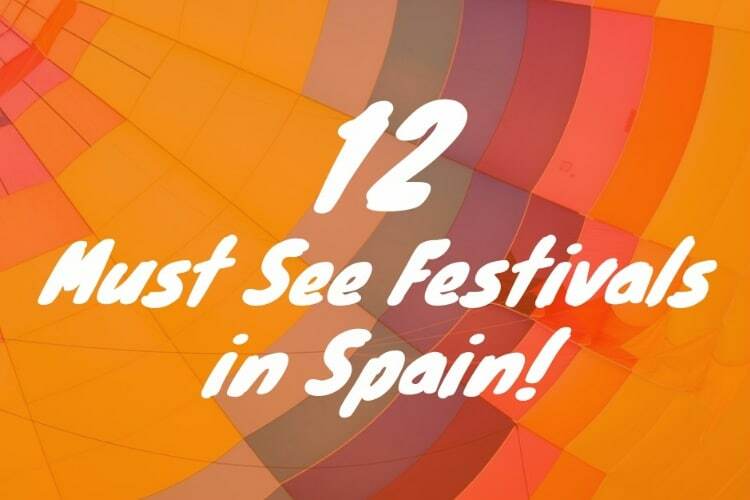 Make room in your calendar for these crazy, fun, and unique festivals around Spain to make your trip even more memorable! 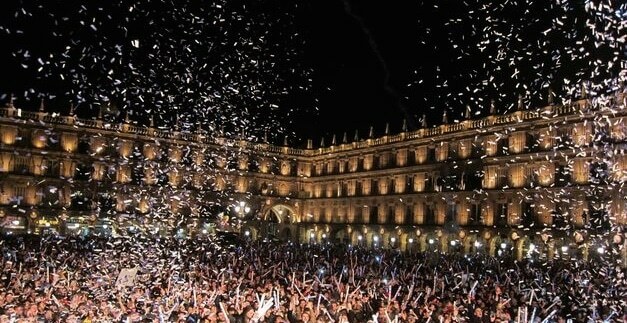 A creative invention by the University in Salamanca, University New Years Eve was created for the students of Salamanca to celebrate the New Year with their fellow students before heading home to see their families. It has now become a massive festival that is celebrated by everyone from locals to tourists. This very loud festival is a wonder in the northern Basque region of Spain. People fill the streets from far and wide as they drink, dance and watch performances by many of the drumming bands from Spain. 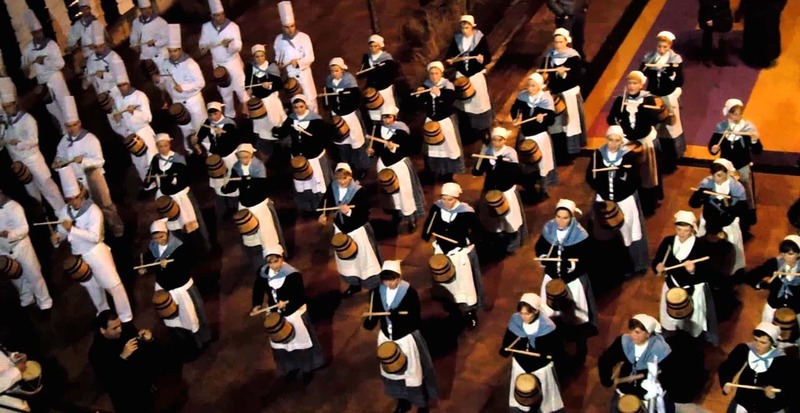 From sunrise to sunset you will hear the loud booming of the drums as bands represent their regions and their gastronomy in a friendly competition. 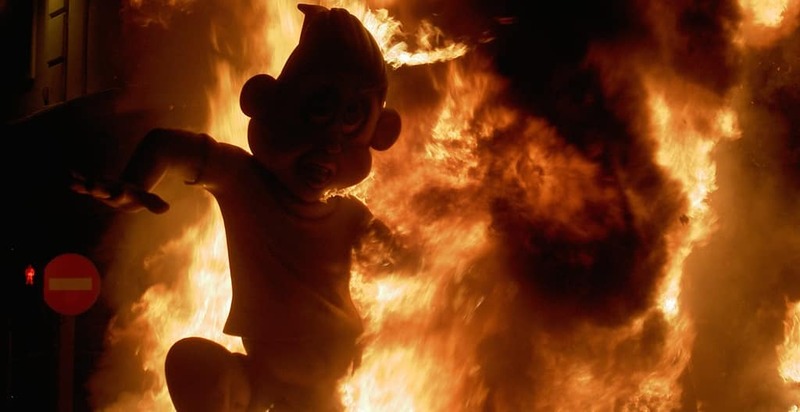 Some call Fallas the largest celebration in the world, with parades, mass gatherings, fireworks ceremonial burnings and large amounts of drinking and dancing in the streets. If you can only visit 1 major fiesta while in Spain, Fallas is tied with Carnival as the one to experience. Traditionally Carnival marks the start of Lent, but as time has gone on it has become one of the largest and craziest parties of the year. Modelled after the celebrations in Rio de Janeiro the city and the people are dressed in colours, feathers, sparkles, venetian masks and head dresses as they dance at street parties, and circus themed events. 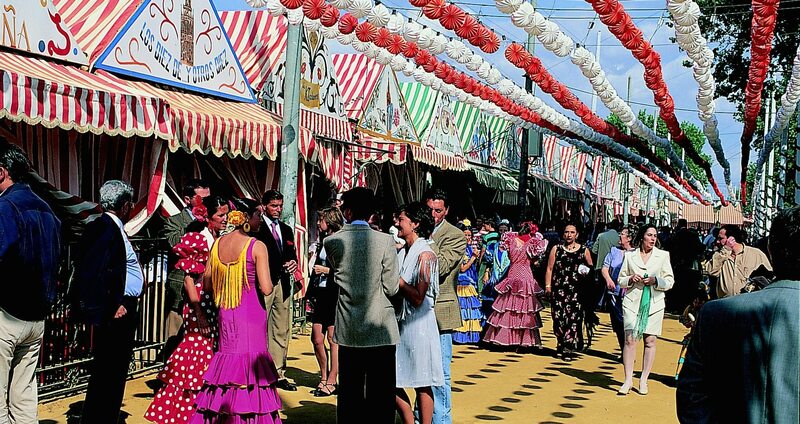 As spring begins to emerge in the south of Spain, the people of Sevilla begin preparing for the famous Feria de Abril. 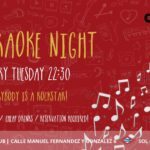 The city centre dresses up to entertain some of the most traditional Spanish activities – flamenco, salsa, food, wine and merrymaking! Over 1 million people travel from far and wide to attend the feria, and maybe you will be among them next year! At the begging of every summer, the little town of Haro gets ready for one of the most unique festivals in the country. 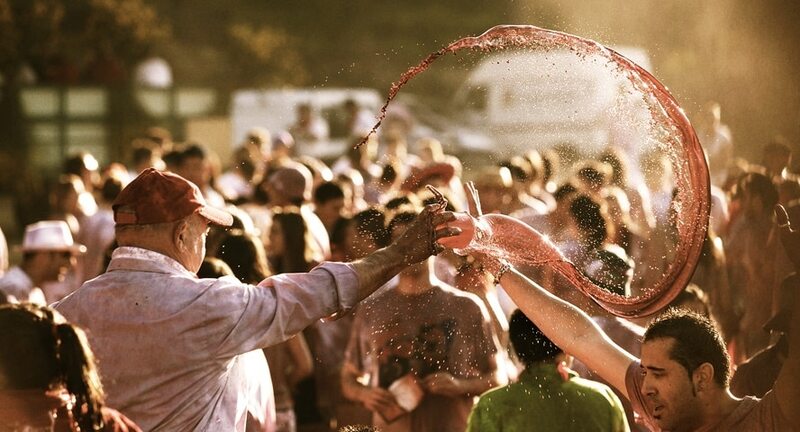 Similar to Buñol’s Tomatina, Haro is a day dedicated to one massive wine fight! What could be better than spending a day in the countryside of Rioja, drinking the best Rioja wine with hundreds of people? 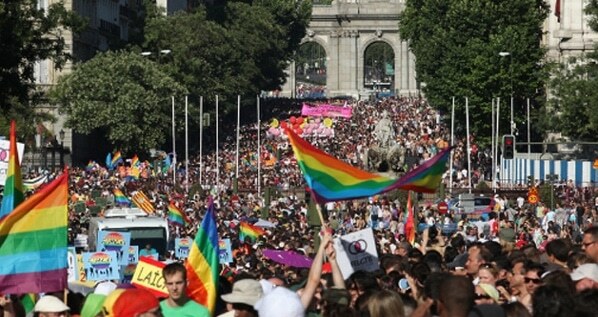 Although there are Gay Pride festivals around the world, Madrid has become quite famous for its celebrations. 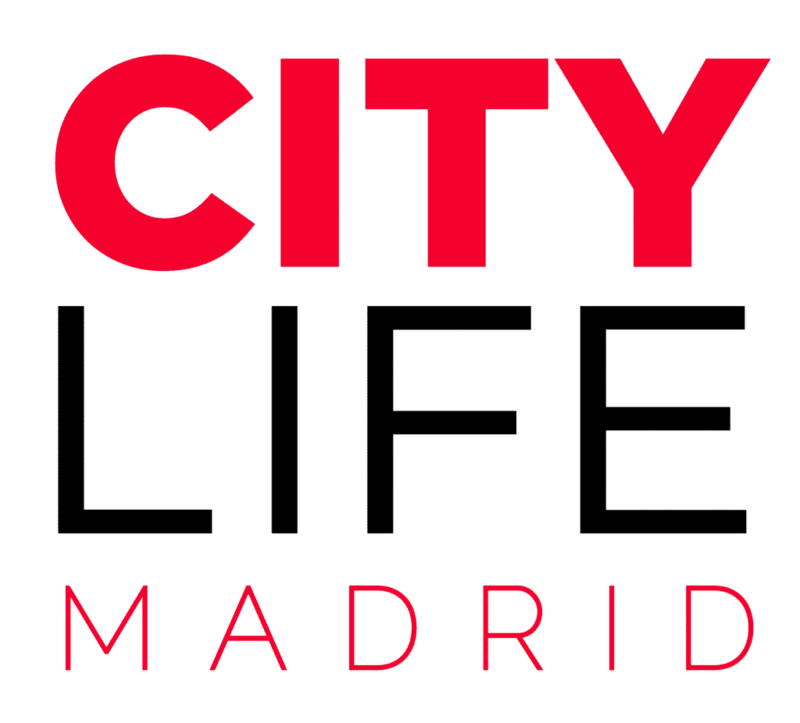 Nominated to Host the 2017 WORLD PRIDE festival, Madrid is the place to be. The entire city fills up with colours, people and music who are all there to celebrate world equality. Probably the most well known Fesitval in Spain, The Running of the Bulls is a token of Spanish culture. 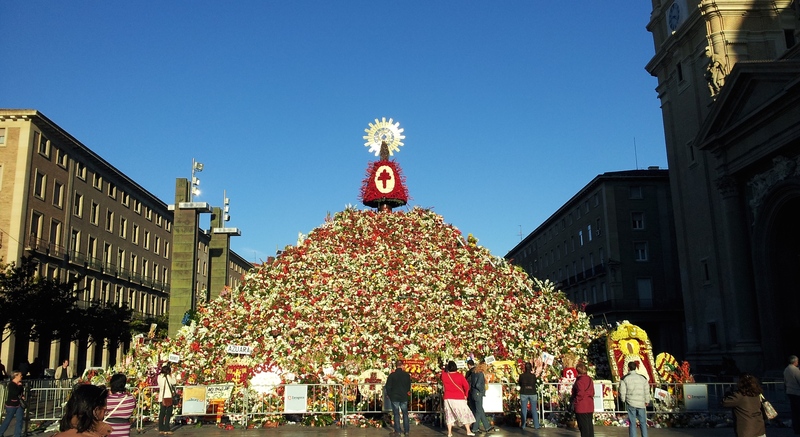 The festival commemorates the be-heading of the Saint Fermin who died a Martyr. 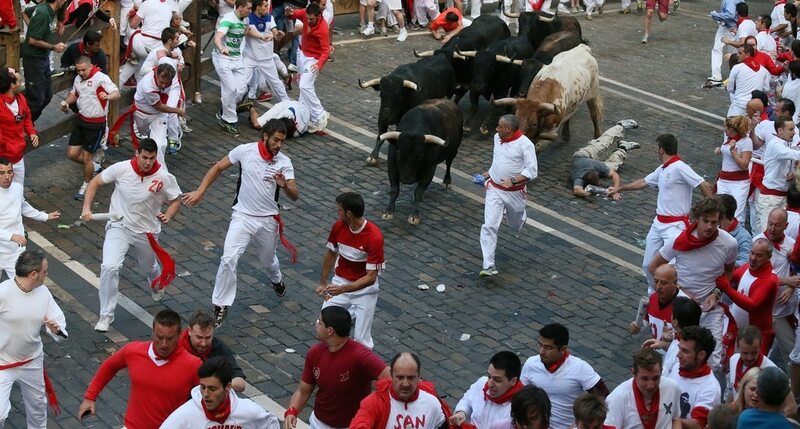 Famously, at 8:00 am a people risk their lives to run the streets with 7 large bulls with the goal of touching as many as possible, while the days close with bull fights. 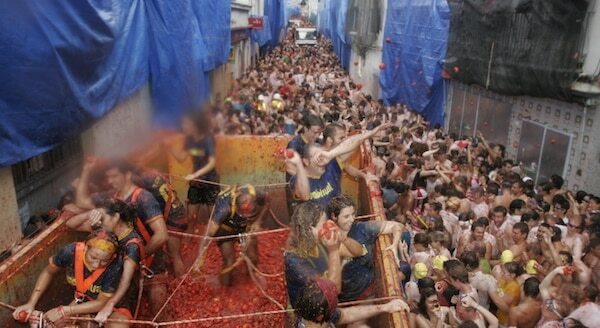 Unlike most fiestas in Spain, Tomatina has no religious background, instead it celebrates the first major Tomato fight in the small town of Buno. People from all over the world travel to throw tomatoes at each other and have their clothes stained in the juice for memories. La Mercè is the largest festival in all of Catalonia! 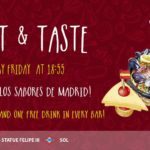 It’s held in Barcelona and involves some of the most traditional Catalan fiesta’s in the region. 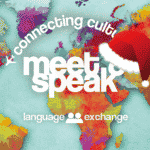 From famous Catalonian castling, massive live concerts, fireworks in Plaza España, community feasts, and fire runs! Another celebration for a Parton Saint of it’s city, Pilar is very similar to a fair with a large food venue, carnival performances, concerts and games. The religious ceremonies of the festival include offerings of flowers and fruits to the main pyramid shaped alter for the Saint. 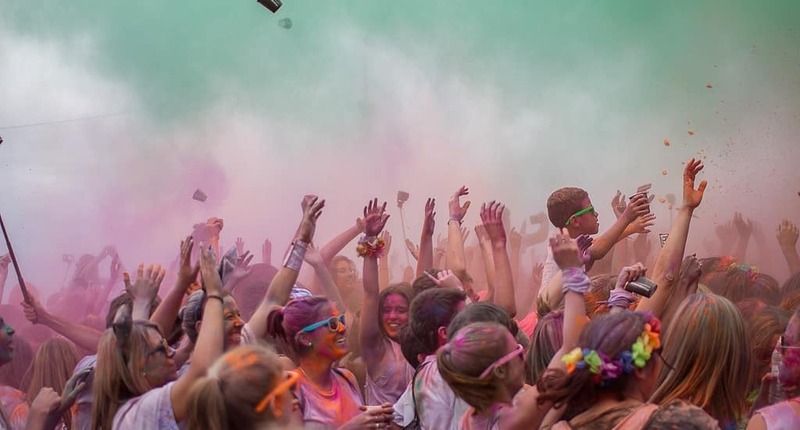 Holi Run is a relatively new fiesta, it is a “marathon” that incorporates the traditions of the Hindu Holi festival of the “Festival of colours and love”. Both day and night events involve throwing coloured powder into the air and embracing them on your body. I already went to Las Fallas and it’s highly recommendable! Party everywhere! 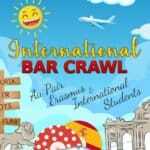 I hope I can experience as much as possible of these fiestas:-) Que viva Espana! 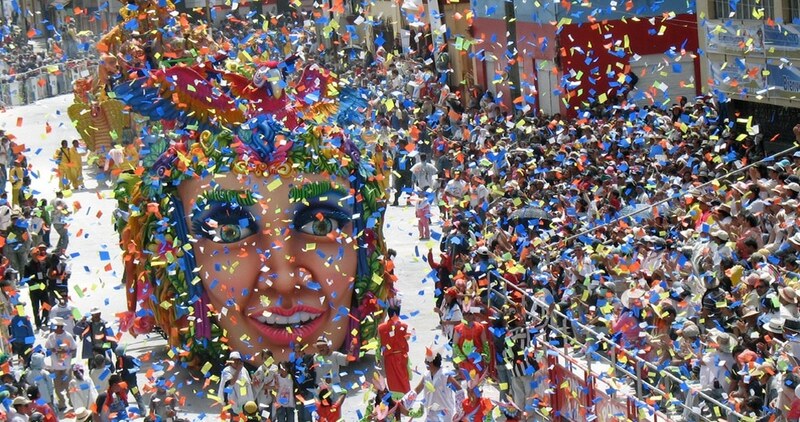 Which is the craziest festival in Spain! Wow, Spain looks so fun. I want to try throwing tomatoes at people.